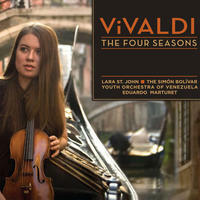 Lara St John : Vivaldi - The Four Seasons. Here comes Lara St. John's newest recording, featuring the Simón Bolívar Youth Orchestra of Venezuela and Eduardo Marturet. The disc features Antonio Vivaldi's seminal work, the Four Seasons, which is the top-selling classical work of all time. There is tremendous interest in this orchestra, and this is the first time it has recorded with St. John following successful recordings with the Deutsche Grammophon label.